The jack-o-lantern grin of certain athletes might seem like an inevitability to the casual fan, almost a price of entry to the professional realm. For one Argentinian dental surgeon, though, it was a chance to turn lemons into lemonade…or beer. 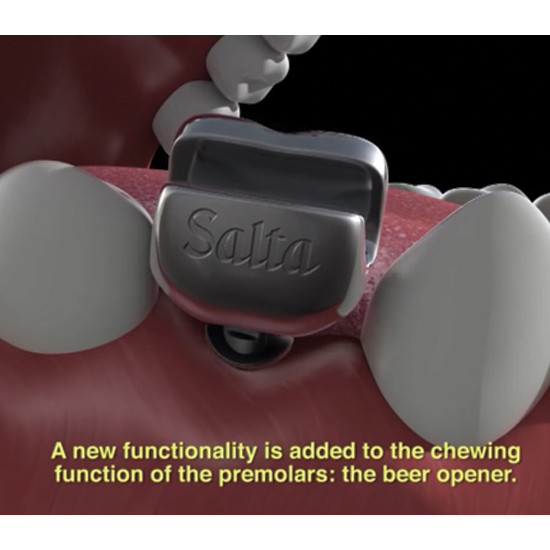 Salta Beer, a popular Argentinian brand and rugby sponsor, partnered with Dr. Sebastian Juri to “give rugby players back the teeth they had lost in battle,” designing a premolar replacement that not only masticates, but works as a functional bottle opener. It sounds like a joke a copywriter might come up with after a few too many beers, but as the ad—conceived by Ogilvy & Mather Argentina—shows, these replacement teeth are very real. And that’s what makes them brilliant: it’s a completely goofy idea followed through with sincerity. Of course rugby players need new teeth. And of course rugby players drink beer. In a way, it’s strange no one thought of this sooner. If you don’t mind the sight of a little dental surgery, the wackadoodle video is definitely worth a watch.